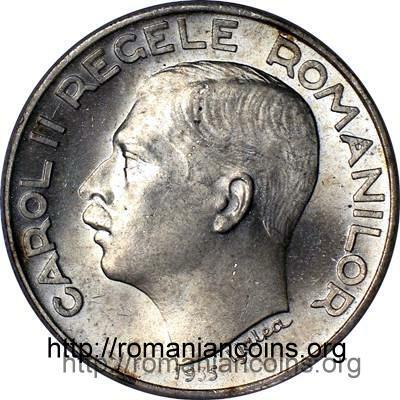 denomination "250 LEI" and Romanian coat of arms the inscription "CAROL II REGELE ROMANILOR" meaning "KING OF THE ROMANIANS", CAROL II head facing left and year 1935. Under the neck lies I. Jalea, the engraver's name. 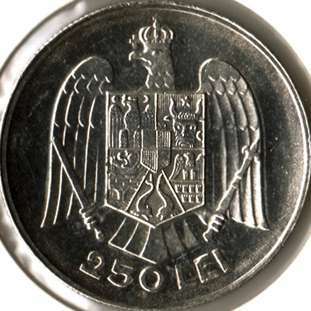 The edge of the coin is adorned with two wavy lines, separated by a rhombus with curvilinear sides. The small axis of the two rhombi is vertical. 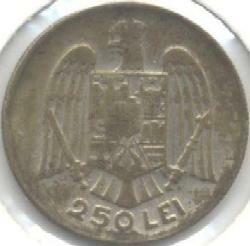 This coin is quite hard to find and not as cheap as expected given the mintage of 4.500.000 pieces. 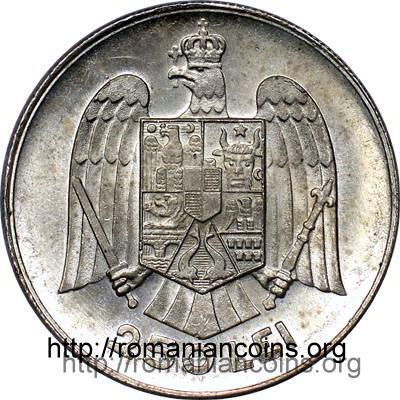 The uncirculated silver coin pictures below are present on Romanian coins through the kind permission of Mr. Radu Lissner. 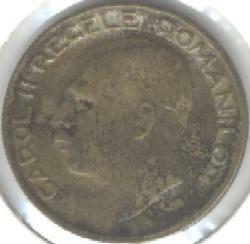 Below you can see a counterfeit coin made of bronze, present on Romanian coins through the kind permission of Mr. Adrian Popovici. 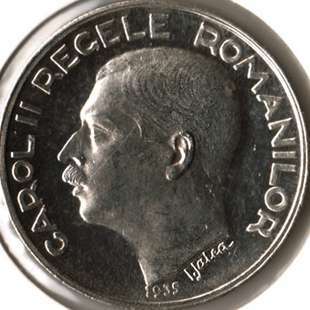 A good share of the fakes introduced on the market in the period between the two World Wars and during the Second World War were manufactured inside the very Romanian State Mint, with the very original dies. Several common metals and alloys were used. Most often encountered are the bronze and lead fakes.